FIFA World Cup- Intelsat satellite services. Luxembourg, June 2014: Intelsat, the world’s leading provider of satellite services, has announced that the world’s leading news and sports programmers are using Intelsat’s global satellite services and IntelsatOneSM terrestrial network to televise the 2014 World Cup being held in Brazil beginning 12 June 2014 through 13 July 2014. 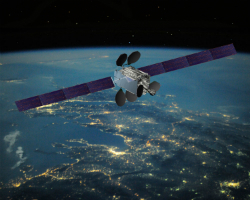 Intelsat’s global satellite fleet will support contribution services within Brazil and distribution of the World Feed to the Americas. Intelsat will also support the contribution, distribution and fiber back-up demands of sports and news organizations in the Americas, Europe, Asia and Africa on an ad-hoc basis using Intelsat’s occasional use service pool. The satellite services provided complement existing full-time capacity arrangements used by sports and news organizations for news coverage emanating from the region. Programmers have also committed to approximately 500 MHz of capacity reserved on seven satellites for full-time services for the duration of the games, which will be used to distribute the World Cup matches throughout the Americas and Europe. The seven satellites include: Galaxy 19 located at 97.0° West; Intelsat 1R located at 310° East; Intelsat 11 located at 317° East; Intelsat 805 located at 304.5° East; Intelsat 901 located at 342° East; Intelsat 23 at 307° East and Intelsat 21 at 302° East. These satellites offer optimal coverage and power to meet the diverse requirements of media customers from around the world who are covering this event. The global media companies, programmers, direct-to-home (DTH) providers and content distribution partners that are relying on Intelsat’s satellite network infrastructure to deliver the World Cup to their viewers include Televisa, TV Azteca, OTI, Univision, DIRECTV Latin America, TV Globo, ESPN Brazil, Fox Brasil, Megavision, Andina de Radiodifusion, Globecast, Overon America, Canal 13, Arsat TVN Chile, FF Work, Softbank for TV Asahi, British Media Communications for the British Broadcasting Company (BBC), and in addition the European Broadcasting Union (EBU) is using Intelsat 805 capacity to distribute the World Feed to the Americas. In addition to satellite capacity, Intelsat is providing teleport services and fiber connectivity through its IntelsatOne terrestrial network in the United States and in Brazil through its alliance with BT’s GMN fiber network and media PoP in Rio de Janeiro. The company also worked closely with customers and partners to secure the appropriate regulatory and licensing approval needed to support capacity and broadcast services from Brazil. In total, Intelsat expects to transmit approximately 50,000 plus hours of live coverage during the duration of the World Cup, making it one of the largest events in history in terms of coverage hours. For the full-year 2013, Intelsat had 100,000 occasional use bookings for special events, sports and news broadcasts around the world.